All of them are related to actions that can be performed by Robobo base actuators, both motors and LEDs. Function: stops the motor selected in the drop-down field. all: it stops all the running motors. wheels: is stops the two wheel motors. pan: it stops the PAN motor. tilt: it stops the TILT motor. The following program starts a straight Robobo movement with no end time (block move wheels at speed) and then waits until the value of the central infrared sensor (IR value at sensor Front-C) is greater than 200 (close object). When this happens, the stop wheels motors block stops the wheels. 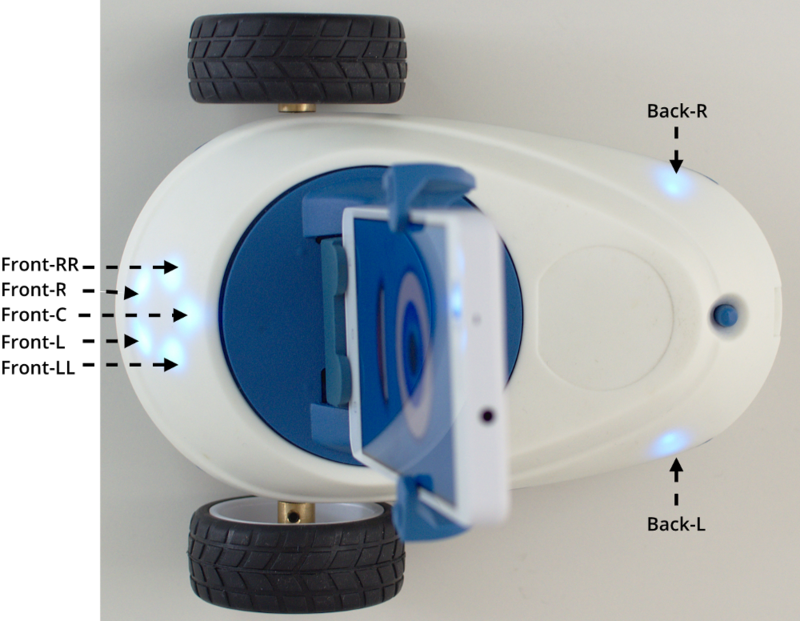 FuncTIOn: it moves the Robobo wheels. This block is used to set the motor speed of the right (R) and the left (L) wheels, and the duration of the movement. Real number that indicates the speed of rotation of the right wheel motor. Range: -100 to 100. Negative values move the wheel backwards. The values of greater magnitude (absolute value), will give greater speed of rotation. Warning: high speed values make Robobo move very fast, which increases the probability of damaging the base or the smartphone due to an impact. Real number that indicates the speed of rotation of the left wheel motor. Real number that indicates the time in seconds during which the speed is applied to the wheel motors. This value only has an effect if the operating mode is seconds (blocking). 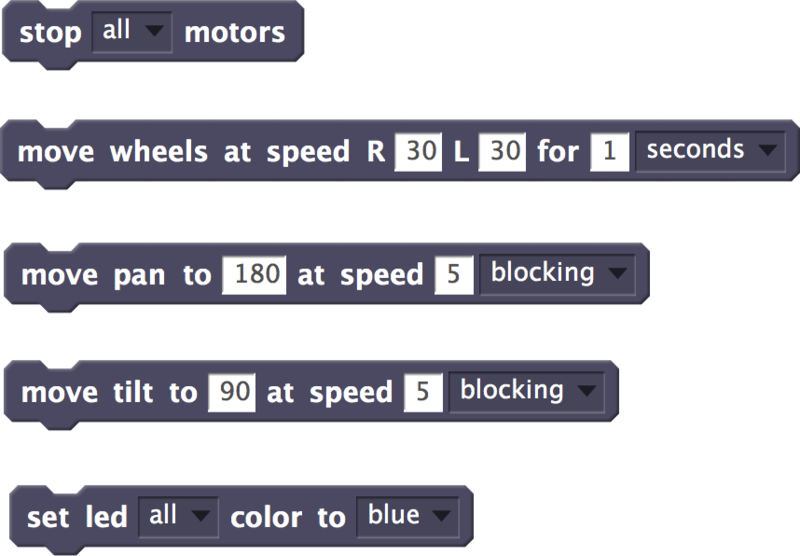 Seconds: blocking mode, that is, Robobo will move the wheels with the speed indicated in the R and L fields during the time set in the time field, and then it will stop both engines. 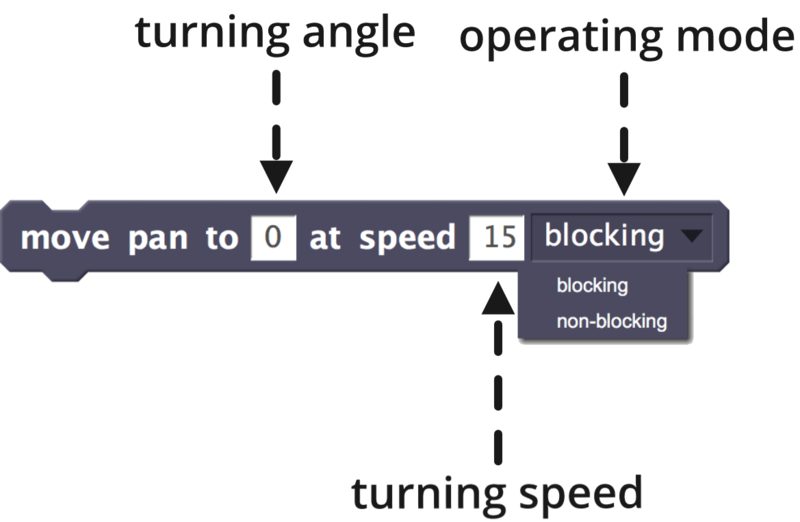 Non-stop: non-blocking mode, that is, Robobo will initiate the movement with the speed of the wheels indicated in the R and L fields indefinitely. Therefore, in this mode, the value of the time field is not taken into account. 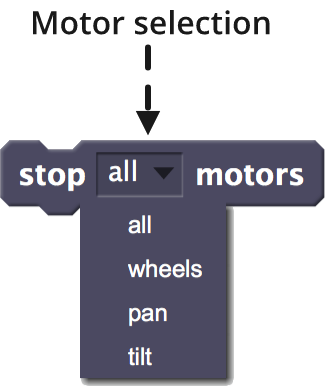 The non-stop mode implies that the wheels must be stopped using the stop motors block. The previous examples use the blocking mode, and they cause Robobo to perform a predefined movement during a fixed time. 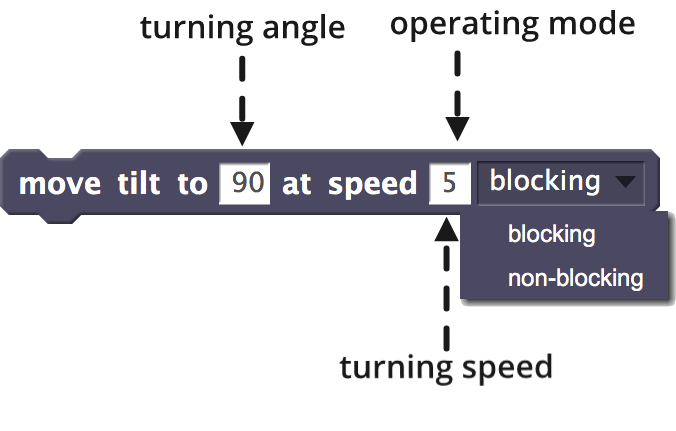 The blocking mode can not be used in those cases where the movement depends on the values of the sensors, because duration is unknown beforehand. For example, the following program starts a straight movement of Robobo with no end time (non-stop) and continues with the same movement until the value of the central infrared sensor (IR value at front-C sensor) is greater than 200 (close object). When this happens, the stop wheels motors stops the wheel motors. 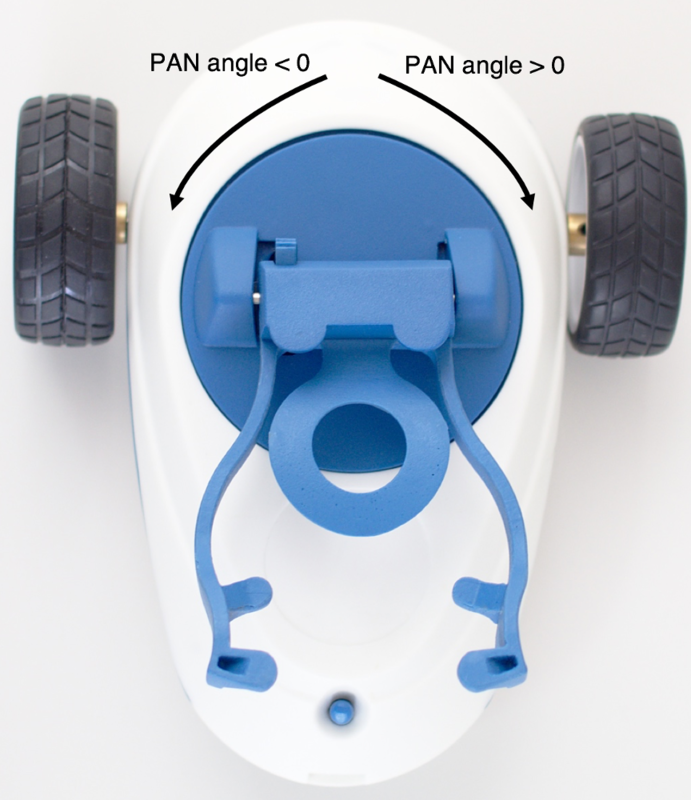 Integer number that indicates the rotation angle of the PAN motor. Range: from -160 to 160, with 0 being the start value (as shown in the image). Negative values rotate the PAN to the left, while positive ones turn the PAN to the right. Integer number that indicates the rotation speed of the PAN motor. Range: from 0 to 100. The greater the speed for a given angle of rotation, the shorter the time it will take Robobo to put the PAN motor in that angle. Blocking: in this mode, the robot continues with the execution of this block until the established angle is reached, without going to the next block. Non-blocking: the movement of the PAN motor starts and the execution of the following block is immediately launched. This implies that the robot can execute the movement of another motor while the PAN movement is running. Real number that indicates the rotation angle of the TILT motor. Range: from 26 to 109, with 90 being the start value (as shown in the image). Values lower than 90 rotate the TILT upwards, while values greater than 90 turn the TILT downwards. Real number that indicates the rotation speed of the TILT motor. Range: from 0 to 100. 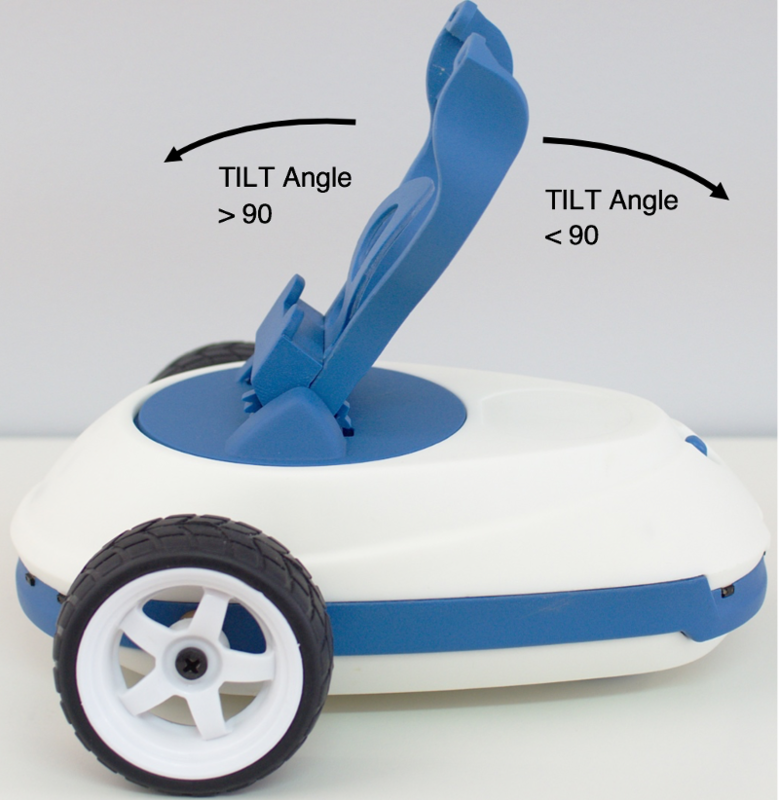 The greater the speed for a given angle of rotation, the shorter the time it will take Robobo to put the TILT motor in that angle. Non-blocking: the movement of the TILT motor starts and the execution of the following block is immediately launched. This implies that the robot can execute the movement of another motor while the TILT movement is running. FuncTIOn: it turns on and off the base LED selected in the led drop-down field to the color selected in the color drop-down field. Range: the LEDs of the base can be switched on individually (the previous image shows the location of the LEDs and their name) or all together (all). 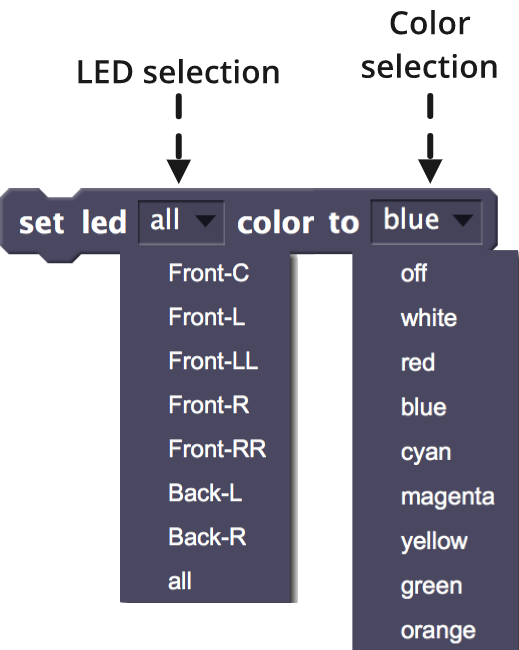 There are 8 possible colors for the LEDs: white, red, blue, cyan, magenta, yellow, green and orange. 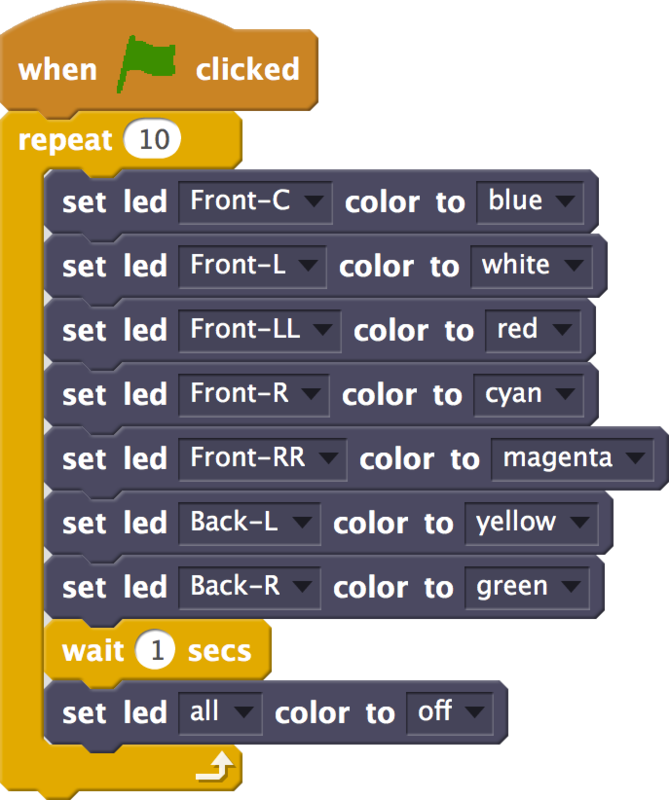 It is also possible to turn off the LEDs using this command, if we choose off in the color.